Mizuno USA, the US branch of global sports equipment and apparel giant Mizuno Corporation, maintains an energetic, location-based consumer marketing program to drive sales at distribution partner retail stores. On the web, this effort includes not only the usual store locator, but also a detailed directory of product categories, special retail features (e.g., golf fitting service, baseball/softball glove steaming service), and consumer events like Demo Days and Fitting Days. When Mizuno USA approached Bullseye Locations, they were looking for a replacement for their existing store locator that would better support these on-the-ground marketing activities, and at the same time would greatly improve operation of the system by automating data updates and simplifying administration. Scheduled XML data import that synchronizes locations and events with Mizuno USA’s internal CRM system. Automatic mapping of sport divisions (golf, baseball, etc. ), product categories (apparel, clubs, gloves, etc.) and features (steamer location, Top 100 Fitter location, etc.) to Bullseye categories and attributes to facilitate accurate and detailed user search. Bullseye’s state-of-the-art store locator and event locator interfaces, wrapped in a custom skin to match Mizuno’s look and feel and to provide additional custom features. Integrated event registration that allows customers to register for individual events, captures registration details as leads, and dynamically generates event rosters. One of the most exciting improvements Bullseye offers is the enhanced Event Locator. Now from within the dealer search results, if a dealer has a future event, the consumer will see an event banner with a link to the event detail information. On the event detail, we are now able to offer online event registration, as well as associate an image. 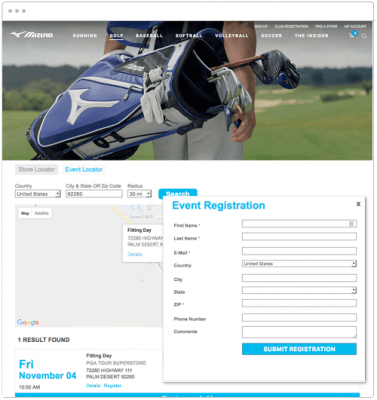 Sarah Foster, Marketing Technology Manager at Mizuno USA, Inc.
Mizuno USA now enjoys a nearly hands-free, integrated, event and retail location marketing platform embedded in their newly re-launched consumer website. Event and retail store data are automatically synchronized on a daily basis to ensure freshness and accuracy, and users can search for locations and events by geography, product, and special services; events are automatically displayed on store locator search results, or the user can easily flip to a dedicated event search that also includes non-retail events. For select events, customers can register to participate directly from the locator. 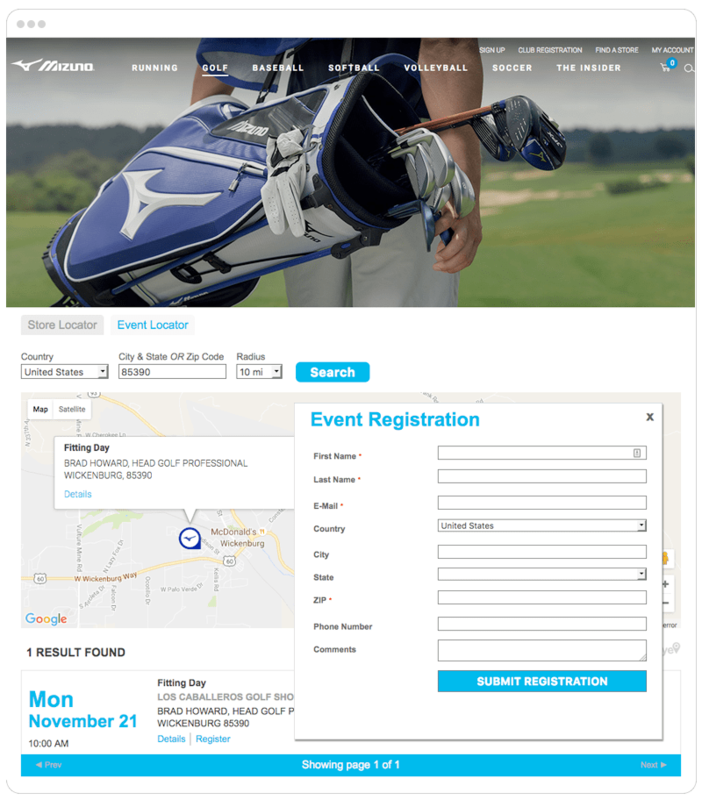 Mizuno USA currently receives a substantial number of location searches each day, and while event registration has only recently been activated, a number of registrations have been submitted, and it is anticipated that activity will grow significantly.